Today, Polka Dot Bride is featuring our photography from Michelle and Steve’s gorgeous Santa Barbara wedding. We loved photographing their Spanish-themed wedding at the Santa Barbara Courthouse Sunken Gardens and Arts & Letters Cafe. 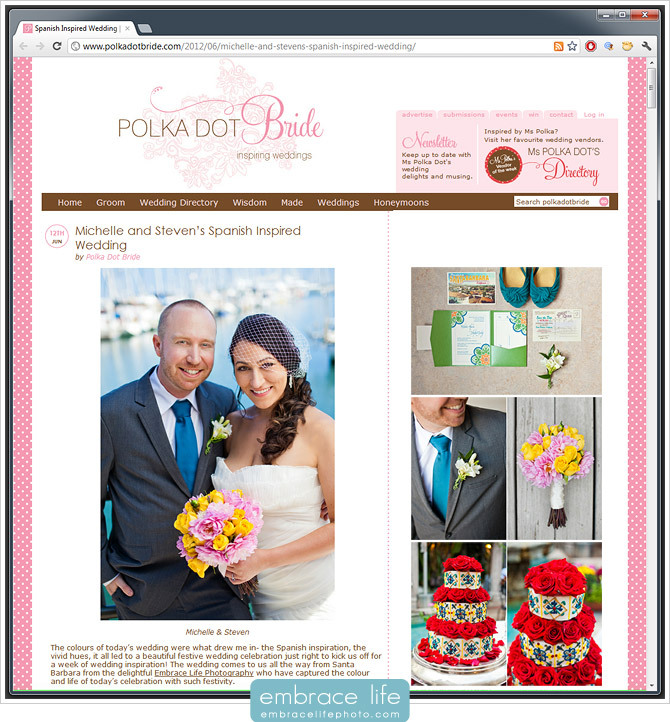 Polka Dot Bride did an excellent job showcasing Michelle and Steve’s colorful, creative ideas through our photography and an interview with the bride. Check out the wedding feature on their site to see incredible work by Lani Blue Stationery and A Piece of Cake, lots of photos, and the great article. Thank you Polka Dot Bride for the gorgeous feature, and thank you Michelle for your kind words in the interview – you’re the best!